Bangkok (Thailand) – May 9, 2017 (travelindex.com) – Siam Piwat Co., Ltd., owner and operator of the world-renowned retail destinations such as Siam Paragon, Siam Center, and Siam Discovery as well as main partner and owner of ICONSIAM, the iconic landmark of Thailand’s prosperity by the Chao Phraya River, has further cemented its position as ‘the Icon of Innovative lifestyle’ in the retail and real estate business after Thailand’s only hybrid retail store Siam Discovery – The Exploratorium has won the World Retail Award for Store Design of the Year — another testament to the company’s success in retail business expansion, ushering in new chapter in the history of Thailand’s retail industry by becoming the first and only corporate from Thailand to receive such accolade from this prestigious award show. In winning the World Retail Award for Store Design of the Year, Siam Discovery – The Exploratorium not only beat its world-class competitors but was also the only Asian mall to rank in the top ten for the Best Experience Initiative category. Chadatip Chutrakul, Chief Executive Officer of Siam Piwat Co., Ltd., stated, “After having launched our five-year policy and investment plan in 2014, Siam Piwat has consolidated its position as the ‘thought-leader’ and aims to incorporate ‘novel experiences that meet the customers’ needs’ in its every core business. We have invested in new businesses, especially retail businesses, and introduced new ideas to expand the success of the retailers and our business allies, so that we can always offer fresh and exciting experiences. 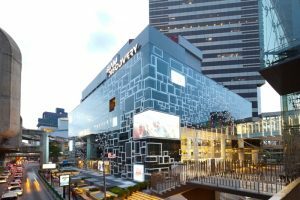 Following the core investment plan, Siam Piwat has written a new phenomenal chapter in Thailand’s retail history by relaunching Siam Discovery as the country’s largest lifestyle specialty store. Siam Discovery – The Exploratorium is a conceptual twist on medium-size retail business by incorporating innovative ideas, a proof of Siam Piwat’s much-coveted success in making a difference in retail industry. “We understand that the life cycle of retail business has been shortened considerably: some product categories/ brands achieve huge popularity for only a limited period of time due to consumers’ continuous search for newness as well as the rise of e-commerce and online shopping. Siam Piwat puts each and every detail into consideration for each and every project. All the projects that have been developed during the past 3 years follow 4 key strategic rules to ensure long-term success: 1) To innovate and stay ahead of others 2) Being customer-centric 3) The Creation of Shared Values and 4) Building Partnerships,” added Chadatip. Creating innovations and offering different, exhilarating experience has been the core of Siam Piwat’s development projects. Each and every project comes with a new, unique modern lifestyle concept that belongs to a class of its own and at times, is the first of its kind in Thailand or even in the world. Technology has brought a dramatic change in consumer behaviors, most notably higher competition as a result of fast connectivity and accessibility and long-term consumer behavior has become much more difficult to predict. Siam Piwat has readied our operation in preparation for those rapid changes and an understanding of consumer group and their diverse needs is essential for our business development. Siam Piwat has set a goal in creating brand value for not just Siam Piwat’s own business, but also brands and products of tenants and partners by revolutionizing the marketing plan. Transforming “shared values” into “commercial values” is the heart and soul of successful brand management, hence the utmost need to create bond and loyalty among customers by making it relevant to their fast-changing everyday life. Siam Piwat believes that through partnership and collaboration with stakeholders, we will create a long-term engagement that leads to healthy growth of business. If we do it in the right way, it can bring about business sustainability. For more information, please contact Public Relations Department of Siam Piwat Co., Ltd.